A couple of weeks ago, I was shopping and parked not far from this tiny door. The very idea of camping in this vehicle stopped me dead in my tracks thinking about how it would work. Could one person survive in here? Sure. I had to walk past it to get to the store and noticed there was a Massachusetts retirees sticker on the unit along with their art work – Sippy Hour, Dawn and Mike. Wow – two people were camping and apparently having plenty of fun in here. 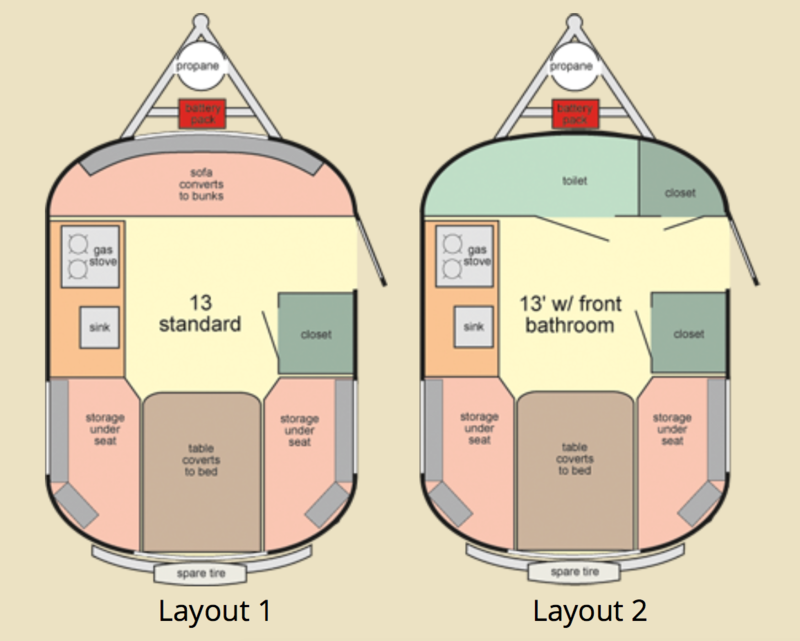 Now, I needed to see what the floor plan looked like so off I went to the web. The Scamp inside is 10″ long, 6’3″ high, and 6’6″ wide. It includes an ice box, two-burner stove, and a table that converts to a bed. Several other items are available but extra. 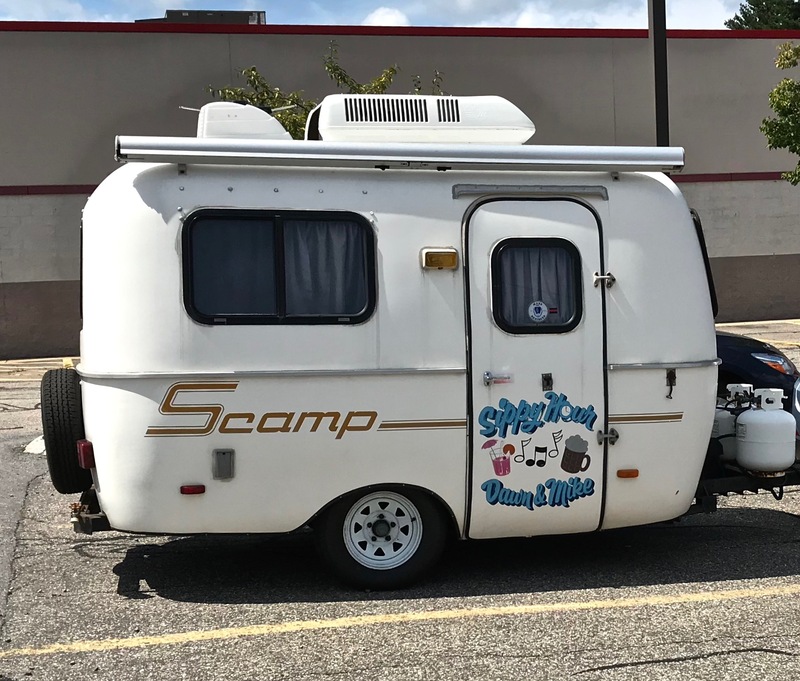 I have experience camping, but must admit this unit would be just too small for me. I do understand the draw because it only weighs 1,200-1,500 lbs. and can be pulled behind most small SUV’s. Do you think you and your significant other could enjoy camping in a Scamp? One thing you can say about the Thursday Doors collection is that it will be eclectic. Check out a variety of Thursday Doors at Norm Frampton’s Thursday Doors August 23, 2018. This entry was posted in Camping, Photography, Thursday Doors and tagged Camping, Photography, Scamp, Thursday Doors. Bookmark the permalink. Not having to crawl on my hands and knees to get inside the door is definitely a positive in my opinion. The mere concept of a bathroom that travels with me makes me weak in the knees. A thing greatly to be desired! But camping out? I tried it once. I congratulate Dawn and Mike, though. It would appear they’ve found their perfect retirement! Great choice for a Thursday Door post! That’s a good answer for travelers who are more interested in exploring the places they go, as opposed to the ones who just want to take a hotel room with them. If all you need is a place to sleep and eat (and toilet) then this might work well. I could see it getting tough on rainy days, though. Good find, great door and thanks for doing the research. While I think it’s adorable, I find myself occasionally feeling “crowded” by my husband in a 2700 square foot house! (He’s retired!) So, “no,” not for me! I think I’d paint it bright red with black ladybug spots all over it, though! Hahahah!! Joyce’s ladybug motif would be perfect. I don’t have a camping gene in me, and that would be too up close and personal for me. But kudos to Dawn and Mike for whom this apparently works very well. Maybe ‘Sippy Hour’ is the magic solution!! I’ve seen these cute little trailers in campgrounds. It sure would be easier to tow that instead of our fifth wheel! I’ve looked inside Scamps and other small trailers. Some of them have more room inside than you would think. I would guess once the camper is set up the people spend most of their time outside. So very cute! I think I could do it …if it was for a short time. I agree with Joanne above. This would be perfect instead of a tent. I’m with Joanne! I will be tent camping this week-end…I’d love to have a scamp it would be down right luxurious compared to my little tent. Not long term, but for a few weeks, and long week-end it would do nicely. Everything is relative isn’t it? 🙂 Hope you have a great weekend and wonderful photo opportunities. It’s very cute and cosy, but probably just a little too small for us. We like compact but not quite that compact! Best wishes to Dawn and Mike – may they have many happy journeys. Not exactly living in luxury but they small campers are kinda cute. I’m not ready for RV type camping yet myself but I guess this is a convenient relatively inexpensive way to go for those who don’t like sleeping on the ground. BTW I added your post to our link-up list. It’s so cute and a great idea with a door! Since hubs is 6’3″ so he would get a sore back from bending pretty soon! That is adorable! I’m not sure how long hubby and I would last in that thing without one of us doing harm to the other 🙂 but maybe for short camping trips it would be perfect! I love tiny campers … but I need a bathroom and a comfortable bed. Mostly, the bathroom. I’d like to park it in the driveway for a cozy place to go read a book . . . It would have to be perpetually “sippy hour” to get me inside that thing. Totally get that it is cute and romantic, and whimsical, but, a bit claustrophobic for me. Kudos to Dawn and Mike. Great door find! May all who enter here be tiny, tiny, tiny humans…. Now that is a Tiny Home! 😉 Way too small for my tastes, methinks! Yes, I think we could 🙂 We’re definitely small space people. The idea being more time would be spent outdoors, so you just need your sleeping and bad weather space + facilities and you’re good. When it’s just the two of us, we tiny tent and are quite happy. BUT, I could never live in that small of a space even as a single person. Temporary travel accommodations, lovely. Permanent residence, hell no. Yikes! My poor husband would have bumps all over his head in this one Judy!